2 Years in a Row! Home Depot has done it again. 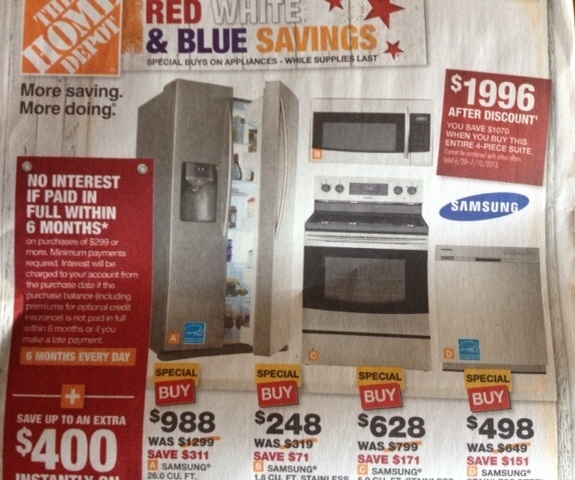 Last year when I wrote about Home Depot's holiday sale Home Depot 4th of July Savings on Korean Appliances I thought their emphasis on Korean brands during their Red, White, and Blue 4th of July weekend event might have been unintentional. However, this year they've done it again. It's not that HD doesn't carry American brands. They've had Maytag and GE in their appliance lineup for many years, and they've added more US products. So, why then we ask are 14 out of 16 items featured on the front page of today's flyer either Samsung or LG? Seems like an insult to me. It's kind of ironic at the bottom of the page, they brag about what they are doing for veterans. What do you think about this? This entry was posted in Appliances and tagged 4th of July, GE, Home Depot, LG, Maytag, Samsung. Bookmark the permalink. I don’t see any dichotomy by Home depot making a variety of appliances available to consumers and taking steps to help vets. I have greater problems with Immelt and GE taking huge tax breaks and promoting “made in America” while at the same time shipping an entire manufacturing division overseas. As a business, Home Depot has a responsibility to both the investors and the consumer. Both profit when the available choices are broad enough to grow their business. Since Home Depot doesn’t manufacture these appliances, it seems to me that helping vets is neither dependent upon nor supportive of those who do manufacture products sold. However, growing one’s business can directly help vets when hiring practices are designed to give vets a step up over non-vets simply because more jobs ought to be available. The problem is that the big box stores are Walmartizing the appliance industry. They hire people and pay them a wage they cannot possibly retire on. The customers go to the independent dealer to often see the product, as well as get educated, and then buy at the lowest price big box store. It’s sad that they pay the person most responsible for the profitability of the company, the least. Walmart, in the name of low prices, has single handedly taken an industry that people used to make a career out of and turned it into a just above minimum wage job with half the workers working part time so they don’t have to give them any benefits. In turn the working public has to pay to subsidize their life. The price you pay for a product is often not the end of the payment. Who you choose to spend your money with does matter.No different than the internet dealers. The internet dealers would not exist without the dealers that show the product. No one would spend much money on something they cannot touch and feel. The internet dealers also deprive states of their tax dollars that support specific programs. Jeff Jones sounds like a Home Depot spokes person. A publicly traded company will always look to support their stock holders before their employees. Ge just spent over a billion dollars to set up their appliance manufacturing outside of Louisville Kentucky. They put over 3,500 Americans back to work. It’s our politicians that have caused our manufacturing to leave this country. Home Depot advertised Korean built products for one reason only and that’s price!